To commemorate the 25th edition of the SXSW Film Festival, we continue our weekly alumni spotlight on careers launched, artists discovered, powerful performances, and more with American comedian, actor, and filmmaker Mike Birbiglia. Birbiglia is a versatile talent in front of and behind the camera. He is a regular contributor on This American Life, hosted by 2018 News & Journalism Featured Speaker, Ira Glass. Birbiglia can be seen in a number of films including SXSW Film alum, Girls (Episodic, 2012) and Trainwreck (Work-In-Progress, 2015). He can also be seen as Danny Pearson in the popular Netflix Original, Orange Is the New Black. In 2008, he opened Sleepwalk with Me, a one-man show and hybrid of stand up and theater in New York. Sleep Walk With Me, would later be turned into a book titled, Sleepwalk With Me and other Painfully True Stories, which became a New York Times Bestseller. After the release of his book, Birbiglia adapted his materials for his feature directorial debut of the same name, and in 2012, the film screened at the SXSW Film Festival. 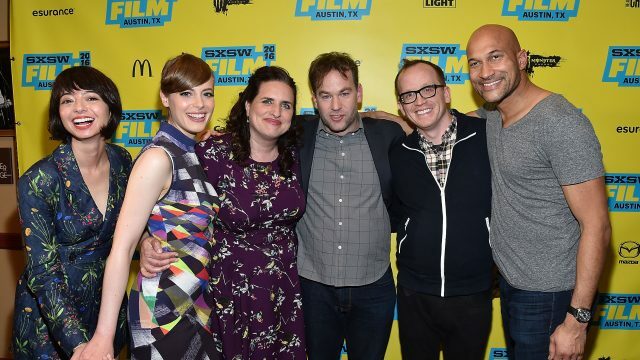 Birbiglia brought his second feature to SXSW in 2016, the ensemble dramedy, Don’t Think Twice, starring Keegan-Michael Key, Gillian Jacobs, Kate Micucci, Tami Sagher, and Chris Gethard. You can see Birbiglia next in the Netflix Standup Comedy Special, Mike Birbiglia: Thank God for Jokes. We are delighted to share his #SXSWFilm25 story with you. “SXSW changed my life by inviting me to premiere both of my movies Sleepwalk With Me and Don’t Think Twice in front of the EXACT people who this film was meant for. Artists, young people, the criminally insane. Another thing I love about the festival is that it’s putting worthy films on a big screen that were meant to be seen that way, but will most likely be seen by people on phones and tablets. In that way, it’s a real celebration of cinema for people who don’t often get to consume films that way. Sometimes with other film festivals it’s so overrun by critics and industry that there isn’t room for the fans and it seems like SXSW goes out of its way to make room for the filmmakers and the fans. And that’s a real credit to Janet Pierson and the amount of love and dedication for the films she selects.